The BlueSolar PWM-Pro series is ready for use with its default settings. It also is fully programmable with help of the dedicated BlueSolar Pro Remote Panel (see features below). Lighting control function, fully programmable with the Remote Panel. Three stage battery charging (bulk, absorption, float), fully programmable with the Remote Panel. Integrated battery monitor function (Remote Panel needed to display state of charge). Load output with low voltage disconnect and manual control (default setting). Load output protected against over load and short circuit. Protected against reverse polarity connection of the solar panels and/or battery. Use the options in the dropdown menu below to select the Charging Amps required. 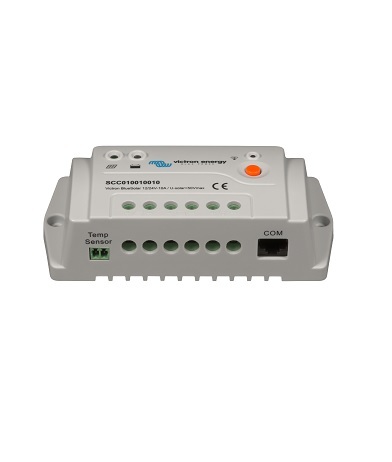 Solar Charge controllers for use in smaller PV Solar Installations. Comes with Automatic 12V/24V Voltage Detection and Current Ranges of 5A to 30A. Click here for an overview of the solar charge controllers and for help in understanding the difference between PWM and MPPT.